Another month playing along at the Card Chain Challenge. As usual there are several options - Color, Sketch, several themes, and a technique. I'm going with the colors and technique of stencils this month. My card traveled to Spain, and I hope Marga likes the card. I was excited to be able to sign up to send her a card as I got a lovely inked one from her last month. 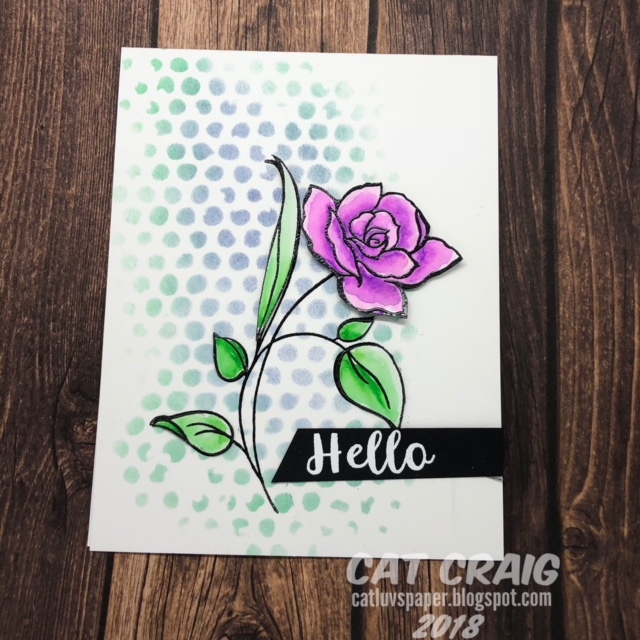 My Supplies included a TH Stencil Bubble, Distress Inks in Cracked Pistachio and Chipped Sapphire; and Zig markers in Lt. Violet and May Green. The stamps are from Altenew's Amazing You set. The flower is heat embossed on the panel, and it was also heat embossed and colored on some bristol paper. I cut out the leaves and the bloom and adhered them on top of the image stamped on the card front. The flower is adhered with very thin foam dots for a bit of lift. Hard to believe August is fading away and fall is knocking on the calendar if not in terms of the actual weather. Last spring I purchased the Seagull stamp set from MFT. I love those silly birds - and generally I can take or leave bird stamps. 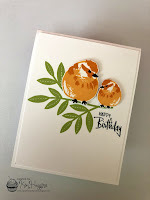 I do love watching birds out the window in my crafty space, but coloring or using them on cards...not my thing. I stamped, colored and die cut a whole bunch of these darling seagulls and came up with these cards. This one started the entire process, and was inspired by the photo below it. 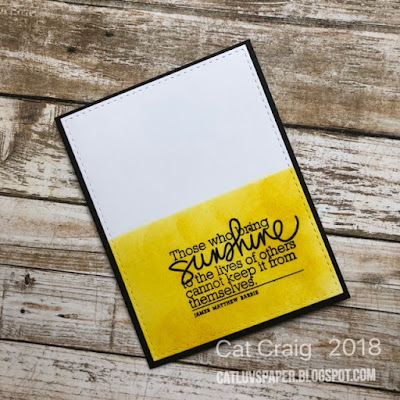 This is one of my last of what I consider my new summer stamp sets. I've been trying to get through them by the end of this month. This card is going to Muse - I was inspired by the leaf branch and the birds, Addicted to Stamps and More- Anything Goes and Freshly Made Sketches for the layout. Coloring was done with copics. (RV00, 02, 21; BG01,02,05; Y04,08,18) The inks I used were memento for the birds and Versamark for the sentiment. The stamps and bird dies are from Pretty Pink Posh and the leaf die is from Simon Says Stamp. 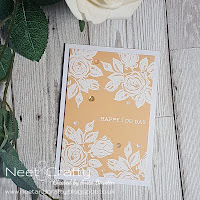 This technique can have such a lovely effect on a card. It was fun trying it out. I rarely do rainbow cards, so this was something new for me. Hi there, I have decided to join in on the second session of MFT's summer school. 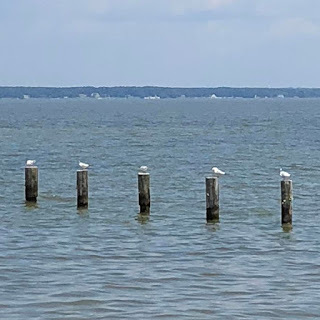 I'm keeping the posts short of words since I'll have 5 posting fairly closely together. This is one of my favorite cards to make. One color - simple. Hi there - Day two's lesson and homework. My bouquet is the main image and draws the eye in, its completed with a simple sentiment. 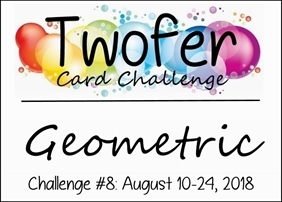 I am sliding in at the last few hours to get a card in for Twofer # 8 use a geometric shape is about to close. This month went by so fast, I was shocked that it was time for the challenge to close tonight. I have very few geometric shapes, I love flowers and most of my stamps are flowers. I do have Lots of Dots by Simon Says Stamp and I pulled it out. I selected a medium sized circle a rainbow of Hero Arts ink pads, my black sharpie and went to work. Once I sat down the designs came fairly quickly. I have three cards for you today, and I am submitting one to City Crafter Challenge blog. The theme is under the sea. I wasn't done playing with him, this time I went darker and took away the party hat. I added some clouds as well. This one I am submitting to City Crafters, its not quite cutesy and not nearly as sinister as the next one. Lastly, I went completely off book and hand drew my shark taking the Jaws movie poster as my inspiration up to a point. I drew a rounded rectangle with no bottom and two hill shapes for the mouth. Back to triangles for the teeth, and circles for the eyes. He was colored gray and then inked over with mermaid lagoon distress ink. I added water droplets several times to the teeth and blotted it with a paper towel to get up some of the blue inking. I wanted the teeth to stand out a bit. Isn't it amazing how turning the shape of the mouth upside down changes it from something cute to something much more sinister? Its been a busy week yet again. I have gotten quite a few cards made, but I am not yet ready to post them. I want to send them on their way, so maybe next week. My good friend Peggy had a birthday this week, and here is the card I made for her. She really loved it, and we had a nice day playing with new crafty things. I have a bit of fall here, the design is a bit of Freshly Made Sketches and Shopping our Stash- Silhouettes. 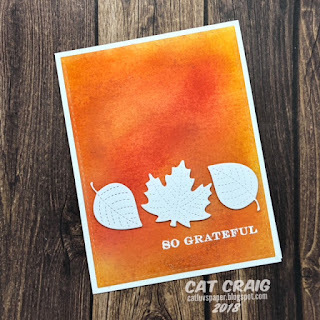 I am not quite ready for the fall cards, but I love to used the Lawn Fawn leaves in white against a colorful background. My background was first water colored with distress inks, then a coat of antique linen distress ink was sponged over it to get some more depth to the color. Lastly a bit of orange and red ink was sponged over parts of the panel. I'm playing along with Fusion. I used both the sketch and the inspiration photo to create my card. I chose just the interior portion of the sketch and those coral roses in the wood container as my main elements. The woodgrain is from Stampin Up, and the rose is from Altenew along with the sentiment. I colored the rose with zig markers on bristol. Thanks so much for popping in. I didn't get a Muse card made. And then I woke up. WIDE AWAKE woke up. Not roll over and go back to sleep woke up. It obviously bothered me that I didn't get a Muse card made. So I set about getting one made. It's been in my head most of the week, time eluded me. I used Hero Arts Unicorn Ink and white Hero Arts embossing powder. The stamp set is Mama Elephant Water Blooms and I added the drawn in frame with a white uniball gel pen. 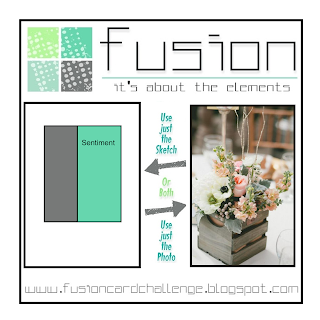 I was inspired by the flower clusters and the colored panel with white embossing. 3:36 am time to go back to bed. Thanks for visiting. Here is my second card today. 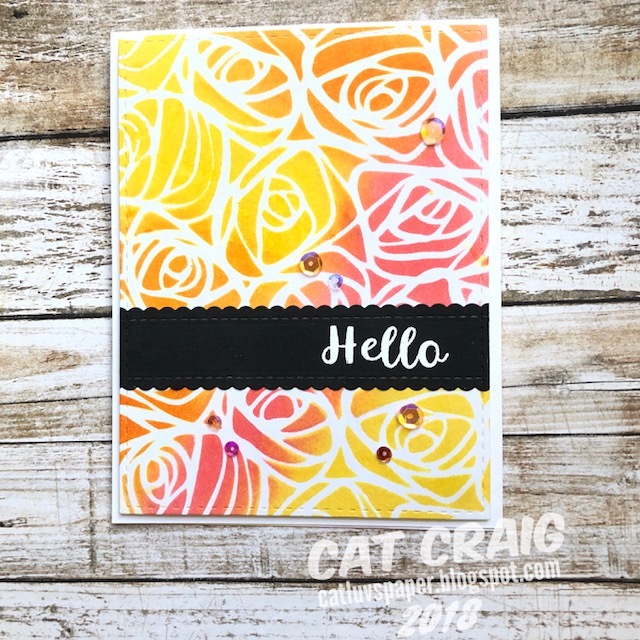 I kept those distress inks on my desk and added worn lipstick and spiced marmalade to the squeezed lemonade for this TH Scribbles stencil card. 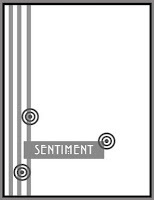 The sentiment comes from Altenew, and the dies are from Simons and MFT. I am submitting this to both Freshly Made Sketches and Simon Says Stamp's Wednesday Challenge - Distress It. It has been a busy week sorting out a new printer and laptop. Both decided that their time was up almost simultaneously. I had a bit of a learning curve - my old laptop was 11 years old. I was running Vista as my operating system. Windows 10 took some getting used to. I am still discovering new things. 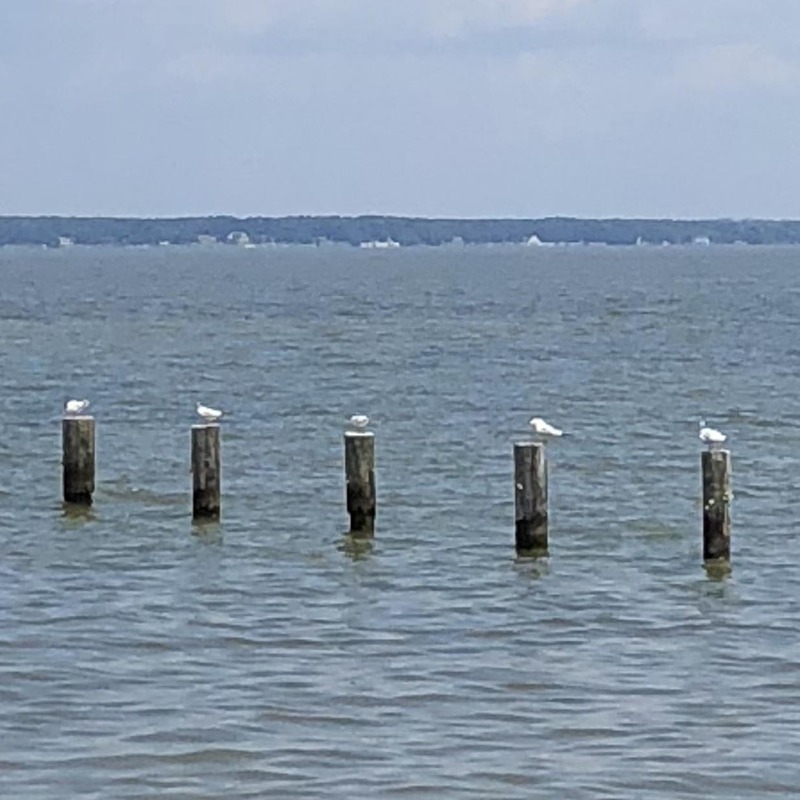 I haven't had time to delve into my new photoshop elements (old version 8 new version 18). I hope to get several cards made to day, my browser has 9 challenges open that expire very soon. I love this quote and I love it with squeezed lemonade distress in sponged over it. I had made a resolution of sorts to keep up with my Christmas cards and make 5 per month. I fell off that resolution wagon in May. I am behind by 20 cards. Fortunately there are several challenges running right now that inspired me. I've die cut my front panel with two SSS dies, Stitched shapes and birchtree window. I mounted that panel on a piece of MFT cornflower glitter cardstock. I added a bit under my sentiment (Stampin Up) strip. A few tiny 2mm pretty pink posh sequins were added to finish it off. This was a fairly quick card to make and I will likely make at least 4 more for the stash. 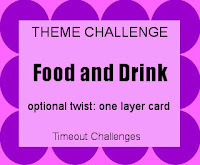 I'm entering this card to the following challenges. Another Bizarre Day post. August 3rd is National Watermelon Day here in the US. 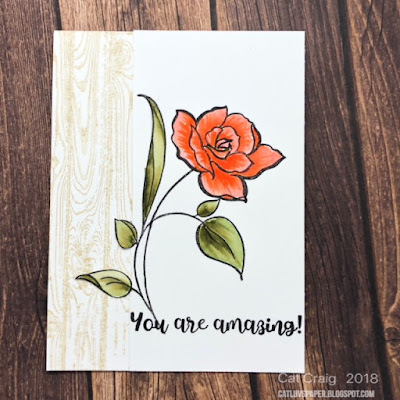 I have one watermelon stamp that I was contemplating using, but then I got an email from Gerda Steiner Designs with a free digi. I have several of her clear stamps and a few digis. I love her sweet images. It was an adorable bear with a slice of watermelon. I had to use the image. If you don't use digital images they are very easy. Simple down load the file, unzip it if needed (you compute will likely automatically prompt you to do this.) 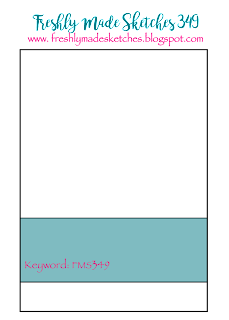 Then open a word processing page and simply import the photo (.jpg) image. You'll be able to resize it on your page by positioning your mouse over one corner. My printer has decided it won't print black anymore. I've tried cleaning the cartridge and the print heads electronically and manually. So a new printer is also on its way to me. I was able to print out my digi image in light gray and I traced it with a copic friendly journaling pen. I printed on Spectrum Noir paper and let it sit about 10 minutes before coloring. After coloring the image and adding some grounding and a few seeds, I added wink of stella to the slice along with some nuvo glaze. 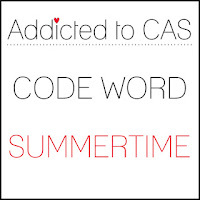 I submitting this card to Addicted to CAS- Summertime and Time Out Challenges- Food and Drink. I skipped the June Card Chain Challenge because I was traveling. Back to it this month, though it was a push to get it done before more travel. I chose the sketch option this time and I hope my recipient in California can see the sketch in the card; as usual I took a liberty or two. The leafy vine is cut from green glitter cardstock, which is hard to photograph. I contemplated glitzing the blooms with some wink of stella but decided to leave them be. Thanks much for stopping by and have a fabulous day. I couldn't pass up these colors at Color Throwdown #504. Black White and Copper - I immediately saw the card in my head and it was easy to put together. 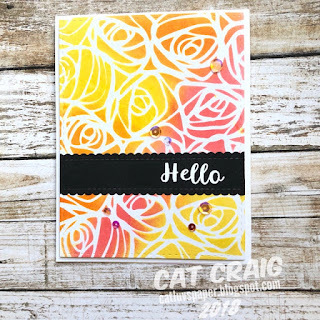 I was inspired by these colors and a card a friend made recently.